Though the holidays are meant to be enjoyed, all too often we stress out about finding that perfect holiday look. Don’t despair! 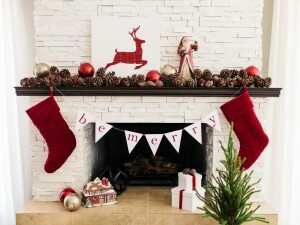 Here are some holiday accents that are are a wee bit different yet easy to find and easy to do. A Profusion of Pinecones! Who says mantles have to be covered in pine? An abundance of pinecones provides visual interest while allowing whatever accent colors you are using to pop. A bonus! Pinecones don’t drop any needles on the floor. Get Carded. Holiday cards are so festive and can be used so many different ways. Create a unique “card tree” using a trellis, old shutter or window frame. A wooden ladder works, too. Or use clothes pins to attach holiday cards to a pine garland framing a doorway or draping the staircase. Flower Power. Flowering plants make a sophisticated holiday statement and what’s even better is that long after the tree comes down, they’ll still be blooming. 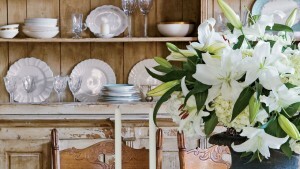 I especially love using white hydrangeas or orchids on mantles and table tops (and as holiday centerpieces!) Other flowering plants that look amazing include cyclamen, Star-of-Bethlehem, kalanchoe. If you are going to make amaryllis or paperwhites part of your holiday decorating scheme, remember to plant them a few weeks ahead of time so that they will be flowering when your guests arrive. Mad for Plaid? Plaid absolutely speaks to many folks around the holidays since it’s both colorful and cozy. A few plaid cushions on your neutral-toned chairs and sofas will immediately say: “The Holidays Are Here” to your family and friends. 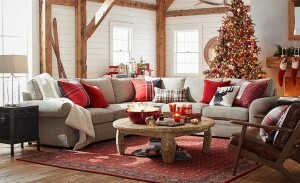 Or cover an occasional table with a plaid cloth and top it with a small tree or wrapped presents. Plaid blankets draped on comfortable chairs near the fire are decorative and utilitarian as the temperatures dip in December. There’s No Such Thing As Too Many Trees. This year, instead of having just one Christmas tree, try having several! Tabletop trees are lots of fun and allow you to spread the holiday joy throughout the house. 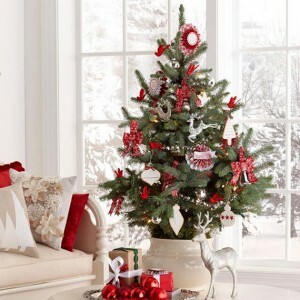 You can also totally indulge yourself creatively by having a different theme on each tree if you so desire. It’s all good! Stretch your imagination a bit and your home will glow with holiday beauty all season long.